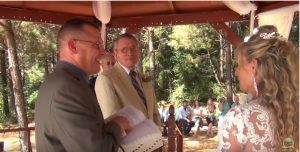 A Common Law Wedding – Hovind & Tocco! – Kent Hovind v. Robert Baty – The Great Debates! Home→A Common Law Wedding – Hovind & Tocco! Kent will be awarded bonus points for settling on a common law marriage consistent with his anti-government, sovereign citizen theology. If a government license should ultimately show up, the points will be taken away from him. you enter into the next steps your adventure together. I now pronounce you partners in Life. You may kiss one another. The above referenced video has been removed!